From Qo'noS to your collection. Own the legendary weapon of the Klingon empire! Disrupter prop replica features electronic lights and sounds. Based on Star Trek III: The Search for Spock. The Klingon empire's most popular accessory is brought to life with the Star Trek III Klingon Disruptor Prop Replica! This legendary weapon comes with electronic lights and sounds for the complete roleplay experience. 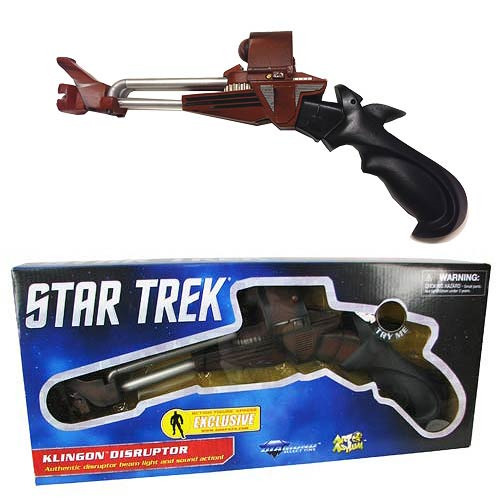 Add the Klingon Disruptor from Star Trek III: The Search for Spock to your Star Trek prop replica collection! Measures about 15-inches long. Ages 10 and up.